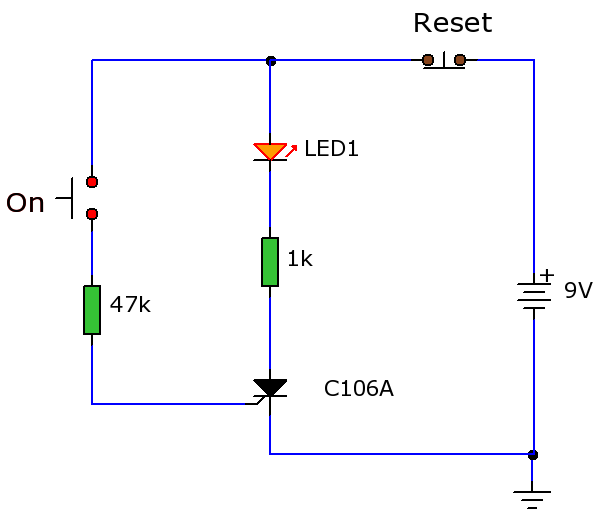 This circuit uses a Silcon Controlled Rectifier (SCR) as a latch switch. Once enabled it can only be turned off by pressing S2 or power is removed from the circuit. The load is represented by the 1k resistor and orange LED, although the C106D can handle much larger loads. Once the On switch is pressed, the SCR receives a voltage on its gate terminal and goes into forward conduction and conducts current through its anode and cathode terminals. This current remains to flow even when the on switch is released, so the LED remains lit. The load can only be turned off by pressing the Reset switch which is a Push-to-Break non-latching push switch. 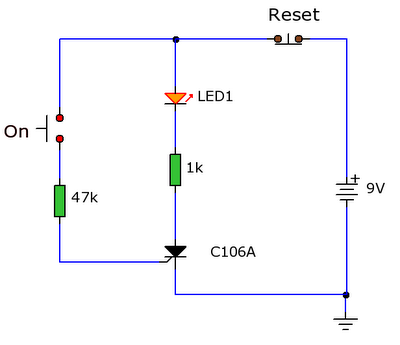 Note that reset switch must be able to handle the full load currents and voltage.